Designed for consistent feeding with fabric such as leather, vinyl and other novelty fabrics. 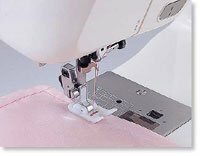 Non-stick foot glides over difficult fabric surfaces with ease improving stitch quality in many problem fabrics (some fabrics may bind under metal feet often causing problems in consistant feed resulting in poor stitch quality). The non stick foot overcomes problems with fabric such as loop and hook tapes, leather and vinyl. Similar to standard J and Clear-view feet.